The Golden Circle is a 300 kilometer road that connects many of Iceland’s natural wonders. On our third day in Iceland we rented a Land Rover and our little group piled into the car to explore, and it was a highlight of the trip. 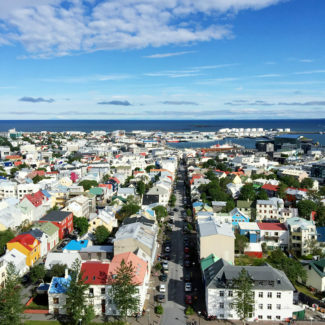 To prepare for our day long roadtrip around Iceland, we thought that we should make a playlist, so I pulled together a quick Spotify playlist featuring Icelandic bands. Iceland has a great music scene, and it’s home to Sigur Ros, Bjork, and Of Monsters and Men. The music provided the perfect soundtrack for our adventure. We might have added some Taylor Swift in too. 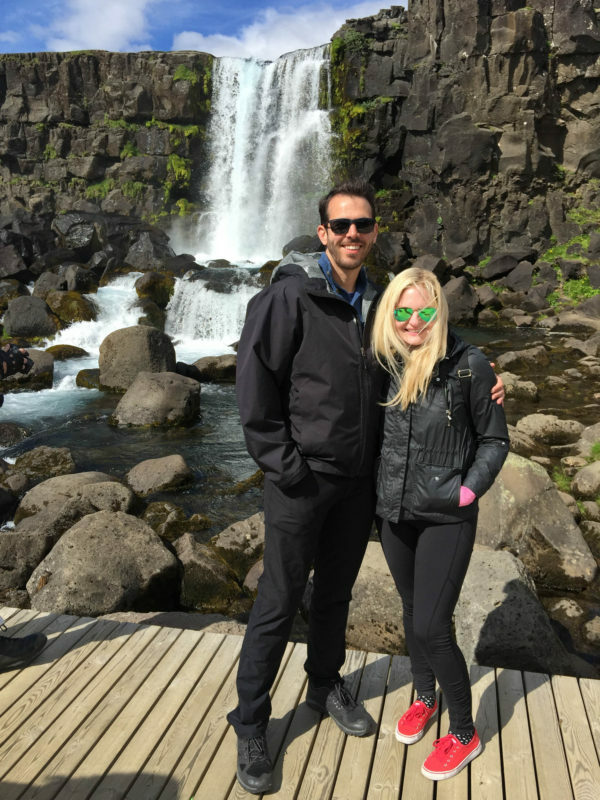 The first stop was to see a waterfall at Þingvellir National Park. In addition to the waterfall, this is a place where the tectonic fissures are splitting apart an inch a year. Plus it was the site of Parliament from 930 to 1798. 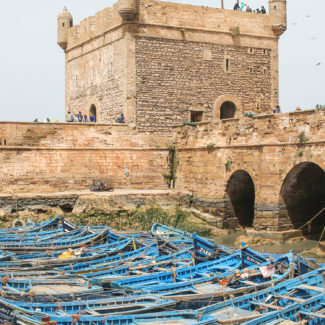 It’s a UNESCO World Heritage Site, and there is lots of explore – you can even snorkel and scuba dive. We kept our stop brief since we had a big day of exploring ahead. The night before this adventure we plotted out our day with a map and researched where to stop for lunch. We found two popular options. The first was a cattle ranch and the second was a greenhouse where they grow tomatoes. We picked, Friðheimar, the tomato greenhouse, because it sounded a little more unique. 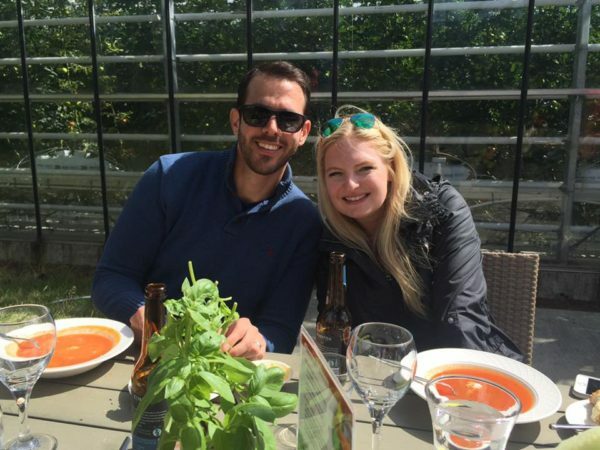 The massive greenhouse produces about 300 tons of tomatoes each year, serving them at the restaurant and distributing them throughout Iceland. The menu at the restaurant is simple. They have bloody marys, smoothies, tomato soup, pizza, and pasta with tomato sauce. 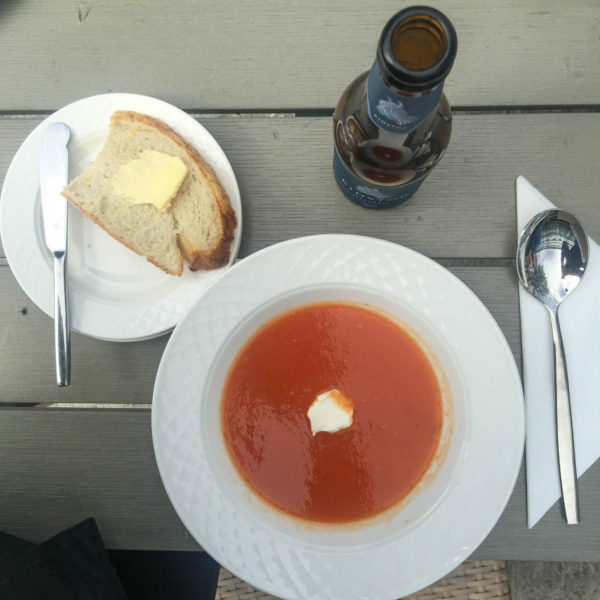 We all opted for the tomato soup, which is served from a buffet along with warm, freshly made bread. 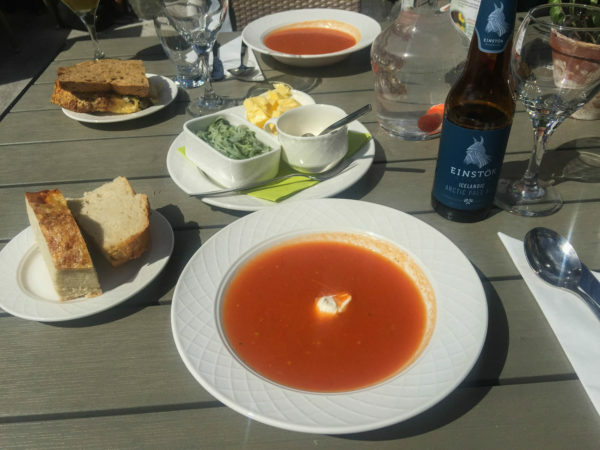 It was one of the more memorable meals we had in Iceland, and also one of the most affordable. The restaurant is very popular (and some of the bus tours stop there) so you might want to make a reservation in advance if you plan on arriving during the lunch rush. Next we stopped at the Geysir (it’s geyser in English). It’s located in a geothermal area and the Strokkur Geysir erupts boiling hot water every 8 minutes (and it smells like rotten eggs). This was a really quick stop, but it was fun to see a geyser for the first time. You can see the Stroker Geyser in action in the video. 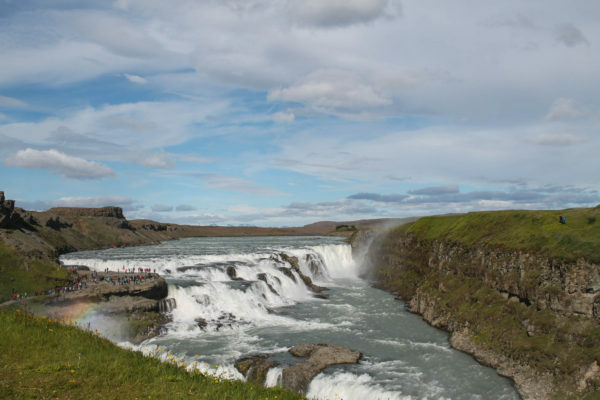 Gullfoss is just a short drive from Stroker Geyser. 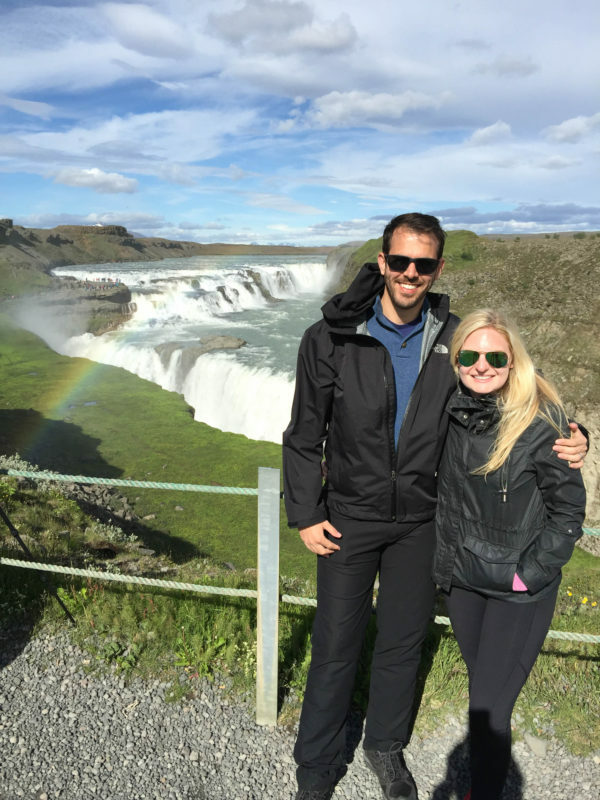 It is one of Iceland’s most famous natural wonders and one of the biggest waterfalls in the world. 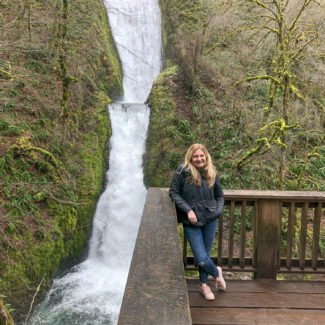 There are several different viewing areas, including one close to the waterfall – which we skipped because we didn’t want to get soaked. 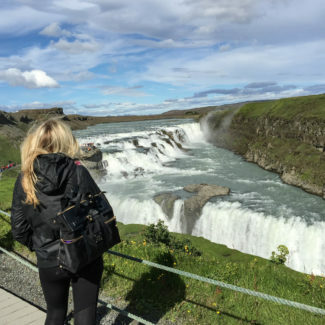 Iceland is home to 4 of the biggest 35 waterfalls in the world. Gullfoss seemed massive to us, but it is only #35. (Niagara is #13 for comparison). 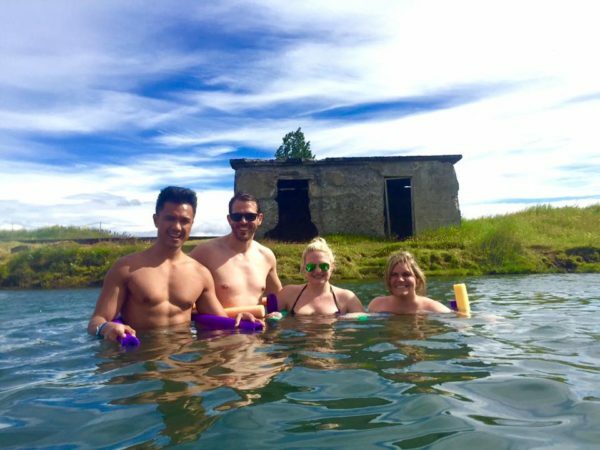 The Secret Lagoon in Flúðir isn’t much of a secret, but it was a fun stop on the Golden Circle. It’s a thermal hot spring, and while it is still popular with tourists, it isn’t as touristy as Blue Lagoon. 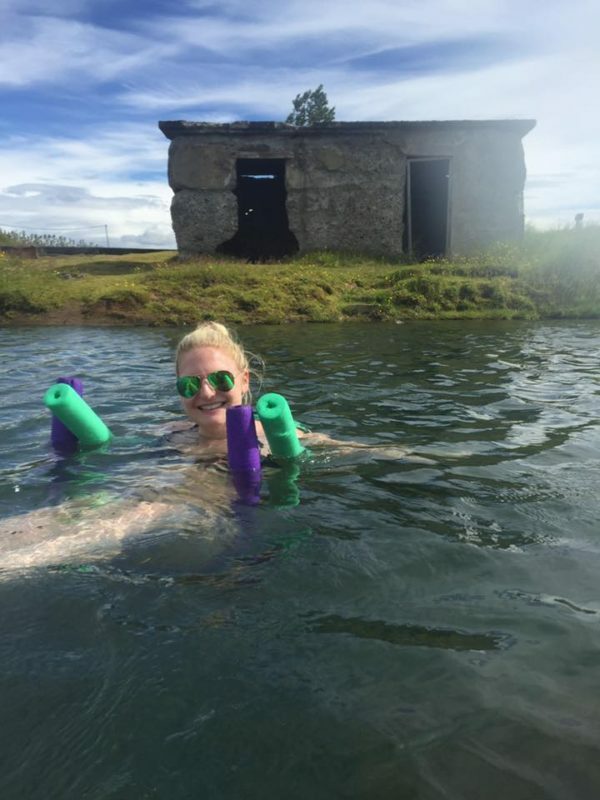 It was built in 1891, and it is the oldest swimming pool in Iceland. The lagoon was a little bit pricier than we anticipated, at $22, but the facilities were nice, and they had towels, showers, and everything we needed. Iceland is called the land of fire and ice. 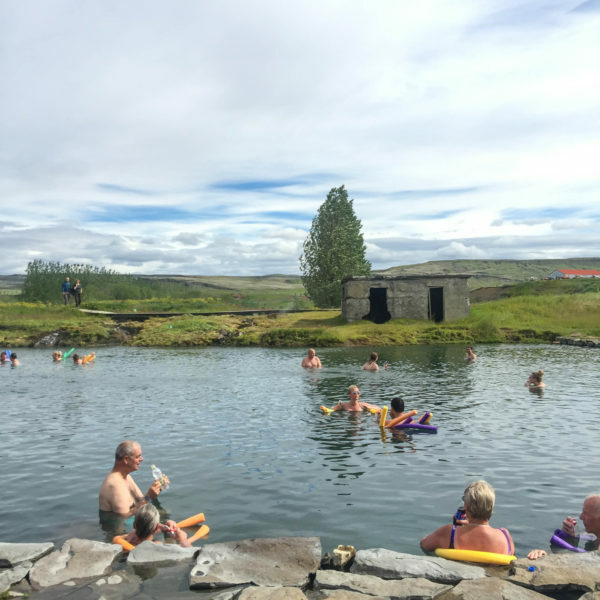 The geothermal heat naturally warms the hot springs in the country (including the Secret Lagoon), and it’s a major source of heat and energy. 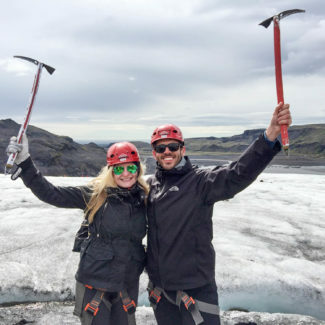 The natural energy source makes Iceland one of the most ecofriendly nations in the world. Lots of the Golden Circle tour buses stop at the Secret Lagoon – their website says the tours come between 3:30-5:30 and that is when it is most crowded. We were happy to be leaving once the tour buses pulled up. 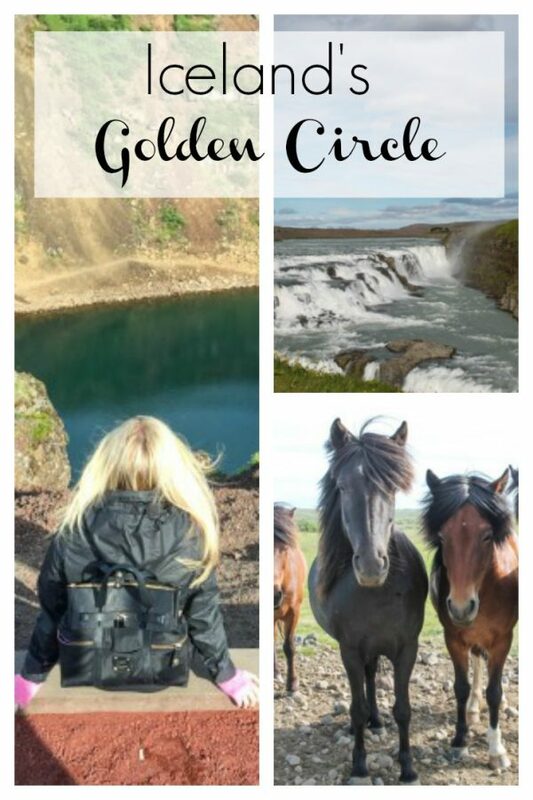 You can’t drive the Golden Circle without pulling over to visit with the Icelandic horses. 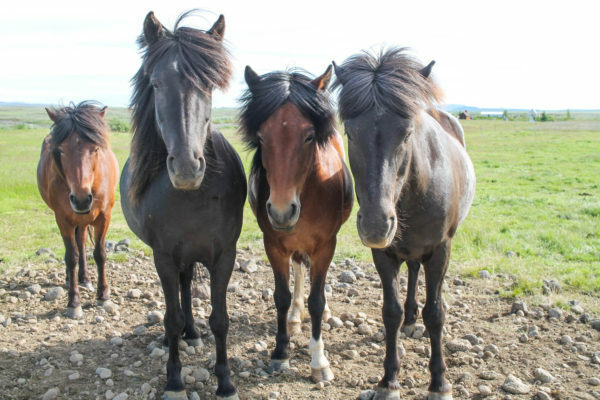 This breed of horse was developed in Iceland and is the only breed of horse allowed in the country. They are smaller, almost pony sized, and are sturdy work horses. 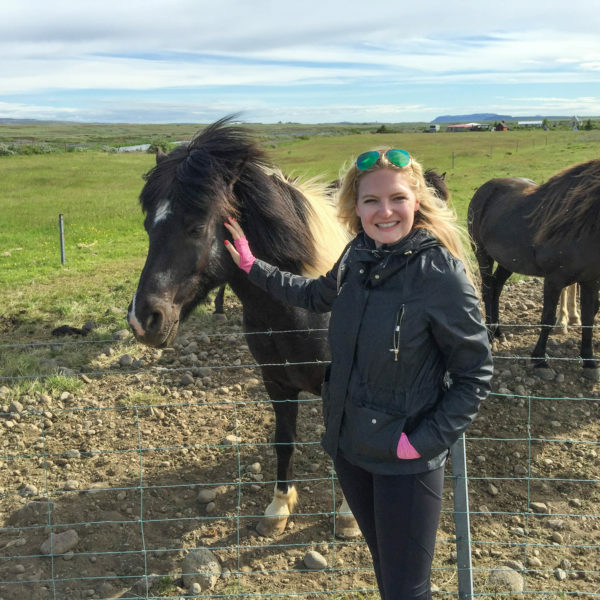 Finding the Icelandic horses is easy. You will see them in pastures beside the Golden Circle. We just pulled over and said hi to these horses who seemed to be pros at posing for photos. 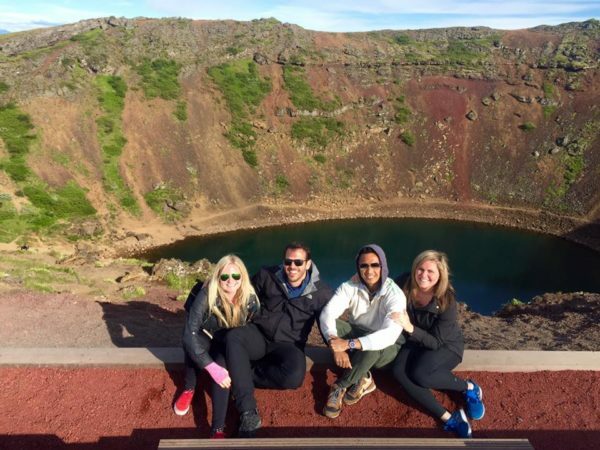 The last official stop on the Golden Circle is a crater lake in Kerið. 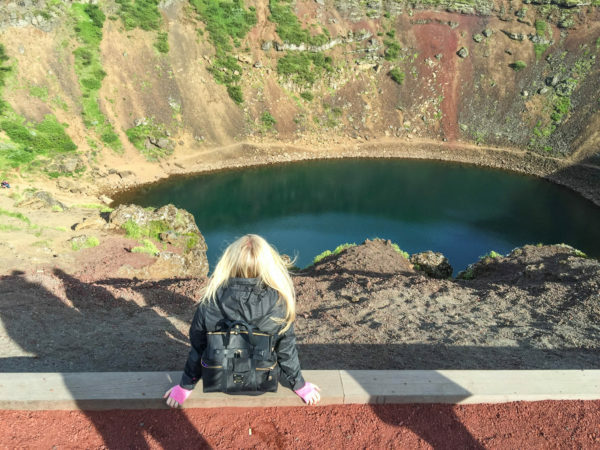 The crater was formed by a volcano, and is surrounded by red volcanic rock. For reasons Libb and I didn’t understand, Charles and Mick insisted that we hike around the crater. It was a nice enough walk, but the view of the crater lake was pretty much the same from all angles. The crater lake is just off of the road, and you pay just a small fee to visit it. 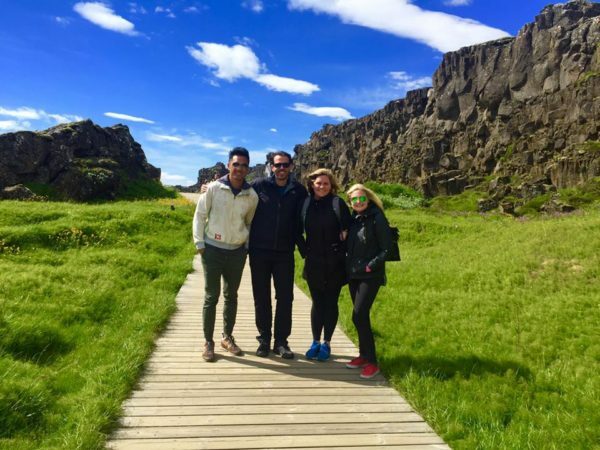 Before we drove back to Reykjavik, Libb had the cute idea of creating our own little stop along the Golden Circle so that we could see Eyrarbakki, a scenic fishing town. This is where our research failed us. We were expecting the Icelandic version of Kennebunkport… but we got something that felt more fitting for a post apocalyptic horror film. 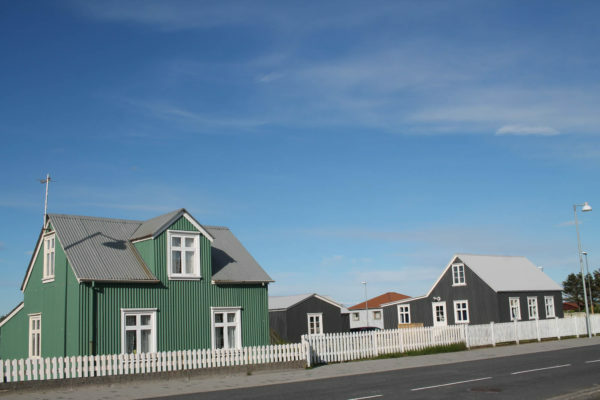 I think that the problem was that we arrived right when the Iceland vs. France Euro Cup game was starting so everyone was inside watching, but when you drive into a town, and don’t see a single person, it’s surreal and creepy. Oh, and the prison you pass on the way to town doesn’t help much either. 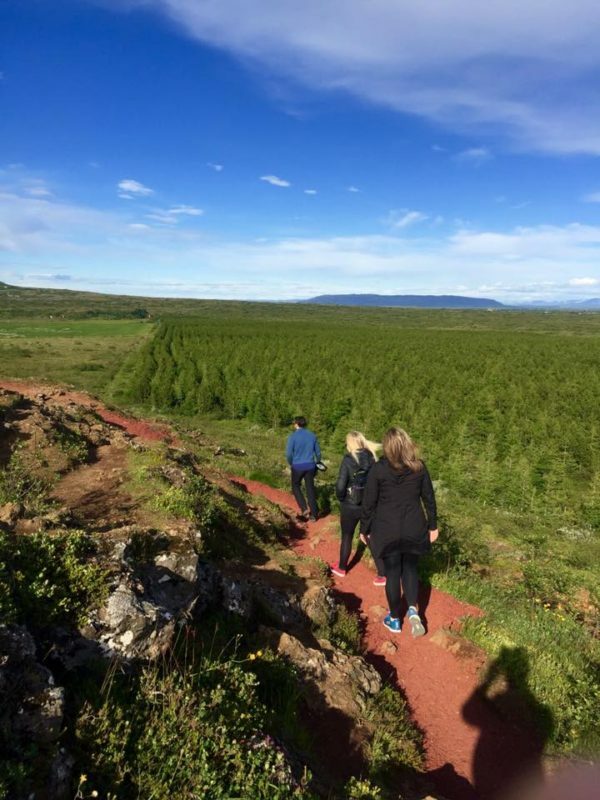 Moral of the story: stick to the traditional Golden Circle route. 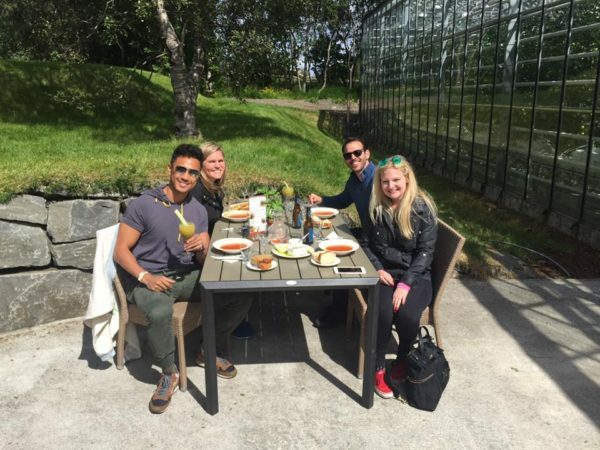 While there are tours of the Golden Circle available, if you have 2 or more people it costs just about the same to rent a car. We loved the flexibility to spend as much time as we wanted at each stop. I also noticed that when a bus full of people unloads, it makes the destinations seem a little crowded. Another thing to note is that we didn’t need GPS for our Golden Circle tour, everything is very well marked. We rented our car from Hertz, not only did the give us an upgrade, when my friend left her iPad in the car they hand delivered it to her.